Cavendish Nuclear, working with OC Robotics and the wider Babcock International Group, is developing the next generation of robotic technology to deliver safer, faster and more cost-effective decommissioning of one of the world’s most hazardous facilities. The company is merging its radiological mapping technology with state-of-the-art virtual reality and robotics to create a new, remotely-operated platform capable of taking apart the soon-to-be-redundant reprocessing plants at Sellafield. The innovation in decommissioning technology is being backed by £1.5 million of R&D funding from Innovate UK, the UK’s innovation agency, including funding from the Department for Business, Energy and Industrial Commissioning Agency. “We are combining technologies developed across different sectors of industry to deliver a breakthrough in the reduction of risks to workers, increased productivity, more efficient management of waste, reduced timescales and lower overall costs,” explained Cavendish Nuclear’s project lead Alan Rutherford. Sellafield is seeking innovative new technology to help it decommission the site’s nuclear fuel reprocessing complex and joined forces with the UK Government, Innovate UK and the Nuclear Decommissioning Authority to create a competition for development funding. 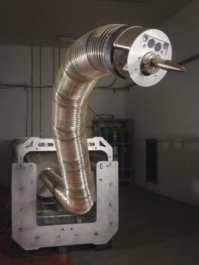 The short-listed system brings together three existing technologies – the robotic laser-snake arm of OC Robotics, the Radscan 3D gamma dose rate scanning technology of Cavendish Nuclear, and the virtually reality expertise of Babcock, to create a remotely-operated platform that protects workers from radiation while giving them much greater visibility of the hazards. The combination of radiation mapping and virtual reality simulation will allow operators to programme the sequence of robotic cutting in a way that synchronises with the site’s waste routes. The system is being developed and tested at Cavendish Nuclear’s regional base at Westlakes, Cumbria, with a demonstration scheduled for late 2018.